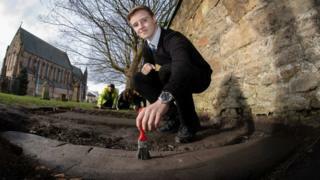 A 14-year-old schoolboy helping out at an archaeological dig in Glasgow has found one of a set of lost gravestones from the Middle Ages. Mark McGettigan's discovery at Govan Old Parish Church led to two more sculpted gravestones being found. Dating to the 10th and 11th centuries, they are part of a collection known as the Govan Stones. The three stones were known about, but lost when a nearby shipyard was demolished more than 40 years ago. Historians and archaeologists had feared the decorated stones, which had for years stood against a wall of the churchyard, were destroyed. The Govan Stones, most of which are now housed in Govan Old Parish Church, are from a period of history before the nation of Scotland existed. Rival warlords were battling for control of the British Isles, and against marauding Viking forces. At the time, Govan was the major religious centre in the Kingdom of Strathclyde. A total of 46 of the stones were found in the 19th Century, and 31 of them were taken into the church for safe-keeping. These artefacts include a sarcophagus which was believed to have held the relics of King Constantine, who was considered a saint. The remaining stones were displayed against a wall of the churchyard, but disappeared following the demolition of the Harland and Wolff shipyard in 1973. They were thought to have been destroyed, but it now appears that at least some of them were buried. Mark, an S3 pupil at Lourdes Secondary School, was among volunteers on the Stone and Bones community dig searching for lost Govan Stones. He said: "I was just prodding the ground to see if there was anything there and suddenly it made a noise and I realised I had hit something. "Myself and two of the archaeologists worked out the area of the object and started to dig it out and clean it. "I wasn't too sure at the start what it was. But then we checked with the records and we realised it was one of the lost Govan Stones." He added: "I am extremely happy, in fact I'm ecstatic at what I helped to uncover." There is now a hope that more lost stones could be found. The Stones and Bones dig was led by Northlight Heritage for the Govan Cross Townscape Heritage Initiative and the Glasgow City Region City Deal. Ingrid Shearer, of Northlight Heritage, said: "We're delighted that our volunteers have had the opportunity to make such a significant discovery. "They've toughed it out through rain and snow over the past few weeks and their hard work and commitment has really paid off. "Govan Old is the oldest churchyard in Scotland and we hope that this find will give a boost to plans for the future." Stephen Driscoll, the University of Glasgow's professor of historical archaeology, said the finds were the "most exciting discovery" at Govan in the last 20 years. He said: "The Govan Stones are a collection of international importance and these recovered stones reinforce the case for regarding Govan as a major early-medieval centre of power." Glasgow councillor Kenny McLean said: "The unearthing of these stones is of international importance, and is all the more remarkable given that they were discovered by a 14-year-old enthusiast, and Mark deserves all the congratulations coming his way. "The excavation was a stage of the public realm work that will make Govan Old and this part of Govan even more attractive for the people who live, work and visit there, and underlines the fantastic heritage of the area."